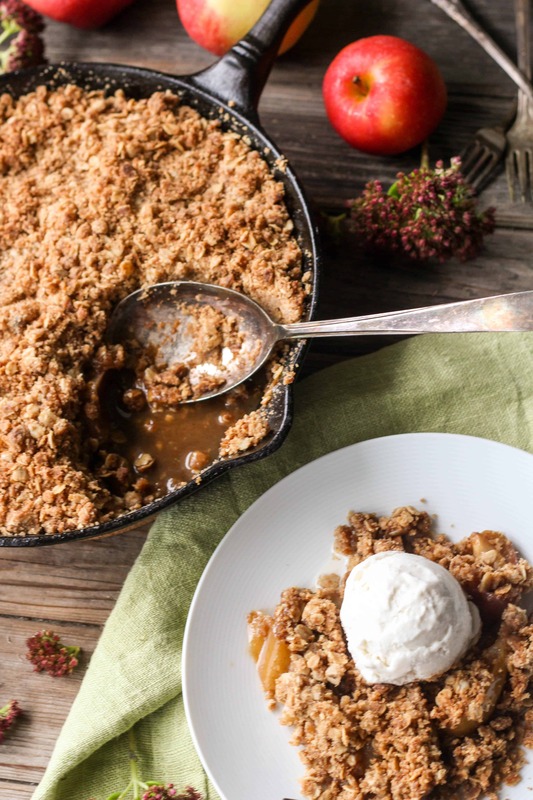 This recipe for Brown Butter Apple Crisp is a delicious twist on the classic American recipe. 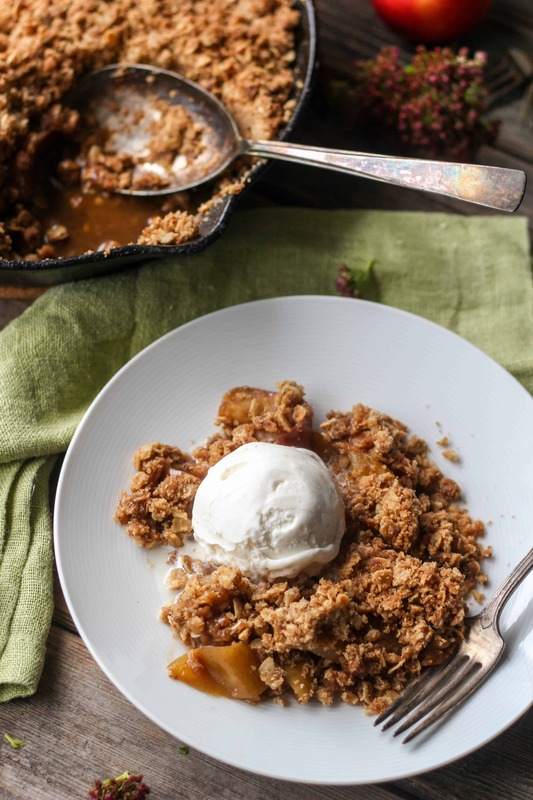 This brown butter apple crisp is the perfect fall dessert! Am I the only person who gets totally skeeved out by all the gory treats that make their way onto the scene this time of year? Foods that look like bloodied body parts just don’t make me want to tie on a lobster bib and go to town. I know I stand alone in the Halloween haters camp, and I’m totally cool with that. But can someone please explain the appeal of a meatloaf thats in the shape of a dead body? Y’all can have your witch’s fingers and your eyeball cupcakes, I’m gonna stick with a nice, warm, classic apple crisp. Its a fall dessert that doesn’t need any gothic adornments or buckets of food coloring to make it special. To me, the best autumnal desserts rely simply on things like butter, cinnamon, brown sugar and love. This post was inspired by my mother-in-law, Karen. I’m one of those lucky people who actually really, genuinely likes loves my husband’s parents. I love his whole family, as a matter of fact. And as more and more of my friends couple off and get hitched, I realize what a rarity this is. A few weeks ago, Chaser’s mom and dad came by for dinner, and Karen brought over her famous apple crisp. I admit, I was annoyed at first because I just got done gorging my way through Italy and the last thing I needed in the house was dessert. After all, I was trying hard to fit back into my favorite jeans. Karen assured me it was healthy. “Come on, it’s fruit!” Not being very disciplined in self control, I scooped out a little piece, took one bite, and remembered that life is way too short to ever say no to Karen’s apple crisp. It’s damn good. I was going to ask her for the recipe, but I thought I’d just try to wing it and see how it worked out. And it worked out really, really well! 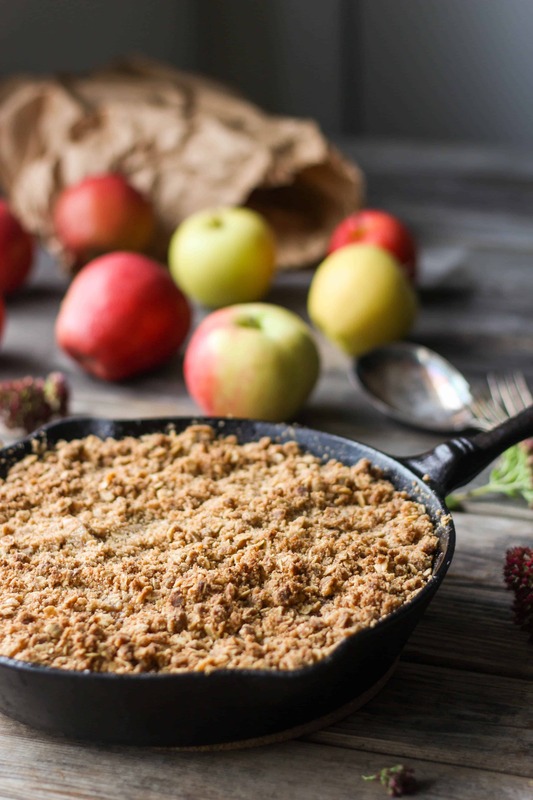 With the exception of browning the butter, this apple crisp is fairly straight forward, as I feel these sorts of recipes are best left without much fussing. Any time I try to add citrus zest or different spice combinations, it never tastes as good as the original. Same goes for my apple pie. They’ve become classics for a reason. Brown butter is the only exception. I’ve said it once, and I’ll say it again: Everything is better with brown butter. This is one of the easiest desserts you can throw together, and it makes the house smell ten times better than any fall scented candle. You don’t even have to peel the apples! Karen doesn’t, and now I don’t either. I love the texture that they bring, and they help keep the apple slices from falling apart. Plus, the skin holds most of the nutrients, so you can feel good about eating it. And, BONUS: still fit into your skinny jeans. Melt the butter and brown sugar together in a medium-large cast iron skillet or other oven safe pan. Cook for about 2-3 minutes until it's bubbling up and the sugar is dissolved. Add the salt, cinnamon and apples, then toss until everything is combined. Remove from the heat, and preheat the oven to 350 degrees. Whisk together the flour, oats, brown sugar, cinnamon and salt in a medium bowl. Melt the butter in a pan over medium high heat, and keep an eye on it. First it will foam up, then as it cooks eventually the milk solids will turn brown and start to smell nutty. Remove it from the heat and immediately pour the butter into the flour mixture, being sure to scrape in all of the browned bits on the bottom of the pan. Mix together until the butter is fully incorporated and it starts to form clumps. Pour over the apples and spread it out until they're evenly coated. Bake for about 30 minutes, or until the top has nicely browned and the filling is bubbling. Serve warm, preferably with vanilla ice cream. I love a warm, bubbly cast-iron skillet dessert. Gorgeous photos! I can almost smell and taste it. What are the pretty little flowers? Thanks!! I’m not sure what the flowers are called, but I’ll try to find out. I have a few of them in my garden, though I’m not sure where they came from. They bloom white at the end of August, and then slowly turn reddish purple. This is my favorite fall dessert! 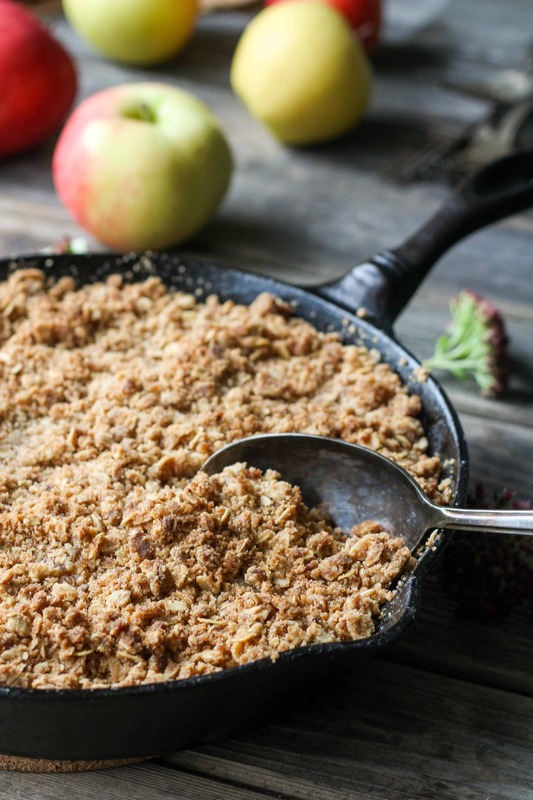 I love anything with a crisp/crumble topping! Yay! You’ll love it with the brown butter. I mean, what’s not to love? ?